Vladimir John Perez is a co-founder of Sea Tea Improv who has been professionally trained in improv at UCB NY & LA, the Groundlings and many other Improv schools. 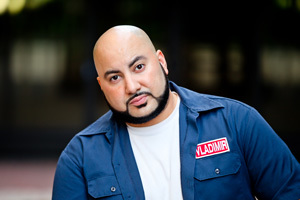 Vlad is also a co-founder of the sketch comedy group Asylum Attic and the monthly Connecticut Improv Mixer. Now living in Los Angeles, Vlad is a member of the iO West featured sketch team TURTLENECK and the sketch team Streisand & Friends, which had a six month run at iO West’s sketch cage match and a UCB Spank show, and Perez, Haynes & Sons that frequents iO’s Go Sketch Yourself! and Not Too Shabby at UCB. He was in The Lonely Island produced pilot “The Tyler Zone” opposite Danny Pudi and a few other things that aren’t really as cool as that. Vlad performed in every match of the 2012-2013 CT Comedy Cage Match series, three consecutive UCB Indie Cage Matches, and the final round of the 2013-2014 CT Comedy Cage Match series, all of which Sea Tea Improv won using the Monoscene format. After 21 years he still hasn’t figured out who his favorite Wu-Tang Clan member is.